Feeling of fatigue, and being tired as a parent of twins, are not unheard of. As a new parent of twins, or worse, as a new mother, everything that can go wrong, DOES go wrong! As a new parent, all days become work days, and all nights become wake-nights. Things spiral pretty much out of control, even before you can acknowledge the existence of a problem. But in this blog today, I’d like to talk about things I learnt through my journey with the Twinadoes! 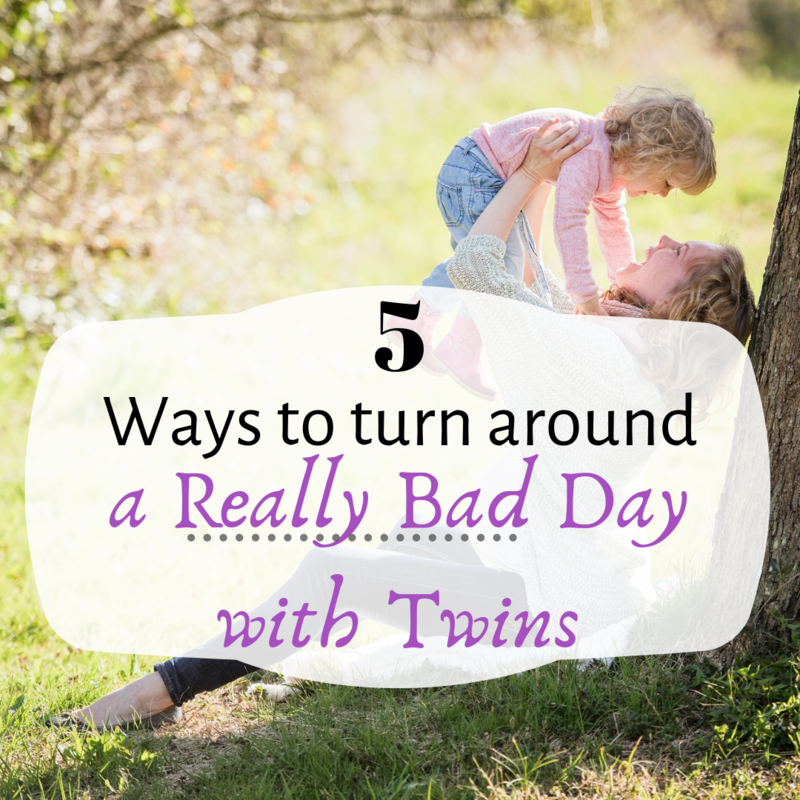 Here are 5 Tips on How to Turn around a Really Bad Day with Twins. As a new other of twins, life is such a huge chaos for the whole of first year that many days you will not realize why you are so extra cranky. You will wonder why you are crying as the twins cry, because essentially, the advice was only to sleep when the twins sleep. Fatigues sets in from very much the moment you conceive twins and continues till they go to college. Managing a set of twins is definitely exhausting. It starts with emotional, mental and physical fatigues and continues to stay in one form or another till the birds leave their nests. Fatigue, basically means extreme feeling of tiredness, which may be a result of physical, mental or emotional stress. Continuing being in a state of fatigue yields more stress, which yields more fatigue. It is very easy for a new mom of twins to fall in to the loop of eternal fatigue, as she can barely extract some time from her job as a parent. We will talk about how to turn around such a stressful day later, but let’s figure out what can be causing your fatigue. As shared a couple of paragraphs above, stress can cause fatigue. In turn, fatigue causes more stress on all levels. It may also give rise to body pain and enhance any underlying health troubles. Migraines can also be a fatigue and stress related issue. With such aspects interfering with your everyday life, and a demanding set of children to take care of, needless to say, life can take a very mundane and ugly turn. Constant feelings of hopelessness or ANGER can pretty much become a way of life, making every little big demands on an everyday basis a challenge. Even a little crankiness from the babies can make your mood and balance spiral totally out of control. And if you are already a parent of twins, I do not really need to explain that phenomenon! Some Things in life need major modifications when you become a parent of twins. You heard that right. Take 15 and lock yourself in a room, even a toilet if that seems feasible. Leave the situation as is (unless a child is in difficulty) and just breathe. Scream and cry if you need to, but take those 15 minutes to fix your sanity and let go off the immense pressure. Stress full situations feel daunting and can also cause migraines or simply headaches. A great way to disconnect from n unpleasant scenario at home is to take a nap. Try to take a nap in silence, and it would help you feel rejuvenated. make sure you fix the children before that, or else you will wake up to an even bigger trauma. Take a walk, go to the park with the kids, or simply grab hold of a friend for a coffee or a beer – but step out of the house. If your parlor visit has been due for a while, it could be a great time to get it done. Simply decking up a bit and moving out of the situation can be very helpful. More so, you don’t really need to spend a bomb to make this happen. It is the exhausting, difficult days that actually challenge every bit of us. They are reminders that we have probably been managing it all on our own, for way too long. It lets you know that you have been exhausted way beyond your limit, and it is high time you break the stress-fatigue-stress cycle. Hiring help in the form of a nanny, day care, a cook, a home keeper, or any task at all. Hire help who would help you in everyday situations and reduce the workload from your shoulders. Yes, it could be an expensive affair, but if it saves your sanity, why not?! You may need to do a little bit of convincing back home, but a house help can majorly change how your parenting journey feels like. I would highly recommend that you keep a good tab on your health. A lot of underlying issues can lead to many “really bad days”. To put a stop to them, you and your body must be equipped to manage it when things get rough. An unhealthy mind and body , not just cause underlying, ignored harm, but also cause a lot more stress triggers in your everyday life. So it may not help when you suddenly pay attention to your body on a really bad day, but it is very helpful to keep your mind and body in check to avoid really bad days in the first place! This blog is a part of the Momology Blog train. Follow easy rules to participate and win BIG through the medium of blogging. There are 8 prompts for four weeks. Every week, 2 winners will be chosen and 1 mega winner will win prizes worth Rs 8000. A total of 18000 Worth prizes to be won! How do you deal when parenting exhausts you? Prisha, I don’t have Any experience with twins but I have experience having two kids:-). I follow all the pointers whenever I feel that I am done and I need a break. Here, with no help in household chores adds up to that. But I just see it as a part and parcel of life and move on. Twin mommies are indeed the living zombies who look for an outlet at any given point in time. Raising multiples is draining. Sailing in the same boat, i hear you and can totally relate when you say keep a good health as it actually affects the whole family if we are sick. Great post. I am mother to a single child. Reading your post I feel like I am too much relaxed . Health should be our topmost priority as you said in your post. Wow. I go crazy handling one and I can’t even imagine how you must be managing two of exactly the same age! I enjoyed reading your post and your tips were relatable. Thanks for sharing! Taking professional help is also a good idea , we can take help of cook , nanny , maids to get household chores done and be free for some time. Some really relatable points there. Hiring professional help.. and yeah.. why not.. to stay sane.. you gotta accept.. you cannot do it all.. and it’s ok.. so take help!! There are many reasons which cause fatigue after being a mom, you have written a very imformative post. I can only imaginw what you might be going through in the initial years of raising twins, I went into post partum dpression after delivering one kid. Kudos to you for the manner in which you are raising your twins. I am also glad that you devised ways to keep yourself from being exhausted. I used to be exhausted with even one baby, so I can’t begin to imagine what it would be like with two, Prisha. Exhaustion is pretty much given. But glad you could find some time for selfcare – some people think exercise only leads to exhaustion but no it doesn’t. Exercise makes you happy and builds your strength, so it’s a must. And of course, I so endorse the idea of hiring, it’s a heaven send. Dance or Excercise are my go to therapies too to deal with fatigue and re-energise with the kids. Kudos to you, Prisha for keeping your calm while raising twins! Mothering with sanity is indeed a challenge & a hell of a roller coaster ride. All your points over self-care so as to keep ourselves mindful & patient while being on our toes are so bang on! Specially where you tell you hire help when we run out of hands & catch up some mommy-time & favorite exercise. The one advice that I disliked after having a child was to sleep only when the child sleep. Taking a break when you are exhausted is the only way to be. Kudos to you for dealing with two kids at the same time!